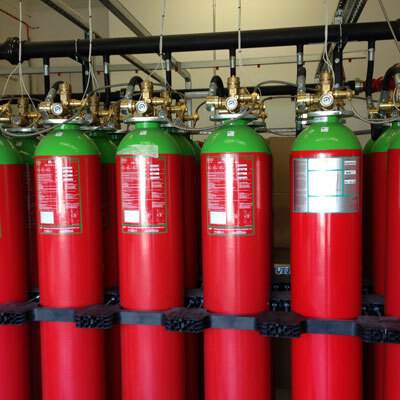 Fire suppression systems provide essential security against fire. Simply put, if an environment is incapable of breeding a fire then there will be no threat of fire damage to the facility. Today’s server rooms and data centres, more than ever, are under enormous pressure to maintain operations. Some companies risk losing millions of pounds with one single data centre glitch. Therefore, it’s not hard to believe that in the event of a catastrophic data centre fire, a company may not only lose millions but may also go out of business. Fire suppression systems provide essential security against fire. Simply put, if an environment is incapable of breeding a fire then there will be no threat of fire damage to the facility. In a Network Critical Physical Infrastructure, the main goal of a fire protection system is to get the fire under control without disrupting the flow of business and without threatening the personnel inside. Workspace Technology offers design and installation of detection measures and a range of Zero Ozone Depletion gaseous agents to. Agent selection is typically based on budgets, room volume and available space. Atmospheric Lifetime (AL) — The time a substance will remain in the atmosphere before it breaks down. Global Warming Potential (GWP) — Is the measure of how much a greenhouse gas contributes to global warming. This signifies the capability of a gas to trap heat within the atmosphere based upon, its capability of absorbing infrared radiation, it lifetime in the atmosphere and what wavelengths of infrared radiation it absorbs. We also offer Very Early Smoke Detection Apparatus (VESDA) systems with enhanced protection through the use of laser sampling which recognises early signs of possible combustion long before any fire suppression system would be activated. Workspace Technology provides a complete turnkey fire suppression system solution. We will undertake all electrical, room sealing and builders works as part of any fire suppression system deployment to ensure that the system will pass the room integrity tests. Integrity tests are undertaken as part of the annual room recertification or as part of a fire suppression system commissioning to ensure accurate room percentage gas volumes and to ensure that the fabric of the room can retain fire suppression system protective gases to ensure effective extinguishing. Workspace Technology will include pressure relief vents, to ensure pressures are kept within acceptable levels and suppression gas remains in the protected space for the required time, to allow the fire to be completely extinguished. For more information on our full range of fire suppression systems and services please contact our sales team on 0121 354 4894 or send us a message.